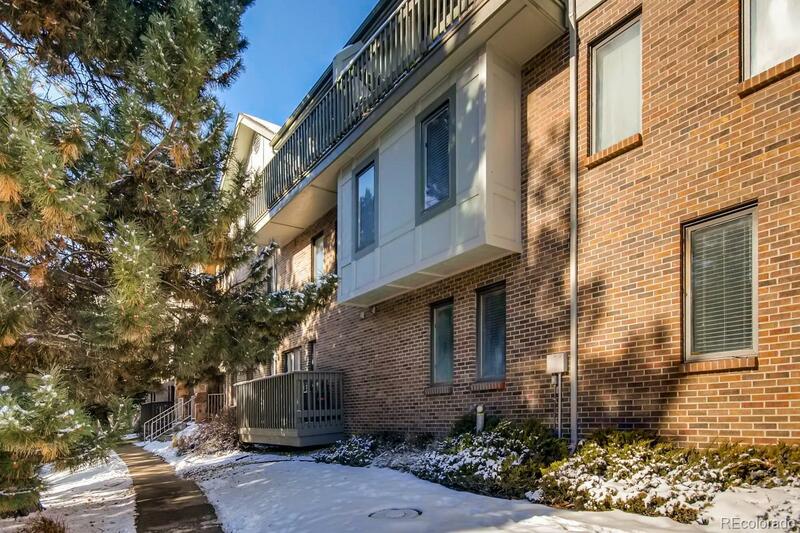 Sunny condo in Cherry Creek school district offers low-maintenance living with family-friendly perks. Southeast-facing windows bathe living areas with natural light. Large carpeted living room has convenient gas fireplace and balcony access with views of trees. Spacious family room/dining room opens to lovely kitchen with subway tile backsplash and double sinks. Kitchen has great work triangle with tons of counter space, and uninterrupted sightlines to living areas that make it easy to keep the conversation going during meal prep or supervise homework. Master suite has private full bath with double sinks. Secondary bedrooms are serviced by their own bathroom. Laundry hookup in unit. Ample storage. Community pool. Elevator access. 2 dedicated covered parking spots. Convenient to highway and public transit. Enjoy homeownership without having to mow a lawn or shovel snow!